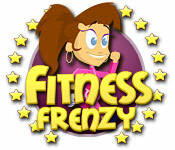 Fitness Frenzy is rated 4.1 out of 5 by 7. Rated 5 out of 5 by merlinarcane from Finally - A Frenzy That Can Be Controlled! At last, a game that is called frenzy but can be won! The game is typical of the fitness craze ones, but the characters are easy to manipulate on to the machines and the levels are winnable. I only played the one-hour demo but got hooked and will buy the full version! I like the upgrades, trophies, and machines -- and actually having to think what each machine will do for the various people who show up for a workout! Give this one a whirl -- I think you'll like it if you liked the Sally's Spa or Studio games. Rated 5 out of 5 by Kimsie1 from Fun, Challenging Game This game starts out nice and easy. You are a trainer in a gym and it is up to you to decide which machines each person has to use to help them meet their fitness goal. If they need to lose weight you use equipment like a treadmill, then a bike etc. You help each customer by directing them to the best, most effective machines for them. Like I said, the beginning is easy, but things get more difficult when you have a line of people waiting and you have to help people if they have a question which is ALWAYS! You are also in charge of the cash register so it can get very busy. You do have one trainer that helps you and eventually you get a man that cleans the machines. After about ten levels you move to a different gym so things don't get dull. I really do enjoy the game and if you want to get things off your mind for awhile, this game is perfect since you need to be thinking and on the ball constantly. You can buy upgrades on all machines and tv and juice machine. I find myself coming back to play this game every now & then. Give it a try. Happy gaming! Rated 4 out of 5 by xandrakittiluv from Teaching Fun Fitness Frenzy is super fun and gets even better as you go on and unlock new gym equipment. Also , you meet new people. When you think about it ... Fitness Frenzy teaches you some exercises for things like cardio , strength and other things to keep you fit without you noticing! Rated 4 out of 5 by Pucktweety from Great I haven't quite finished this game yet for the simple reason is that I resent the entirely too long levels. I haven't actually timed any of the levels but they are at least 5minutes long for each level which is pretty ridiculously compared to other TM games. The graphis are also pretty poor but if you can get past that, this is a game which will take hours to complete, not take an insane amount of skill but still be challenging enough and is a lot of fun. Rated 3 out of 5 by alsteele28 from OK as app This is an old game and perhaps the genre is a little 'tired' now as whilst the hours free trial went quick, it didn't exactly entice me to purchase the full game. This is the sort of game that are 'ten a penny' in the app store and can be purchased for as little as $1 (69p) in various scenarios, Sally Salon, the 'Ada games etc. So whilst the format was good and kept my interest for a while I certainly would not pay (or use a credit) for this game. Rated 3 out of 5 by ItalianChick0188 from It was okay This game was okay, not one of my favorites. The graphics were good. For me; it wasn't challenging enough.